This 10 week training plan, written by former Duathlon Natonial Champion and Duathlon.com founder Eric Schwartz, is for duathletes looking to establish a solid base for their season. Upon completion of this plan, follow up with build and peak training blocks leading into your goal race. Other than week 1, all weeks contain 7-9 hours of training and one day off per week. Before starting this plan you should have at least 3 weeks of consistent training. Duathletes with a primary goal of finishing a short distance duathlon could easily do so with this plan. If you have additional questions about this plan email Eric.Boulder@gmail.com and I'll respond quickly. Warmup with one leg and spinup drills (see http://goo.gl/VjKNv for drills description). Then on flat road or on a trainer use the big chain ring and a gear that allows only about 50-60 rpm. While in the saddle drive the pedals down as hard as possible for 10-12 revolutions of the cranks. Do 6-10 of these starting a new one every 3-5 minutes after warming up. Heart rate is not observed. If these bother your knees then discontinue immediately. 30-40 minute heart rate zone 1-2/easy to moderate effort run. Include 6-8 strides. 2 hour ride. Include 40 minutes at 20 beats below your zone 5a heart rate. If you are not using a heart rate monitor do this at a moderate effort. This should not be a hard effort - it's one you could easily maintain for much longer. 40-60 minute zone 1-2/easy to moderate effort. ///The duration range for long runs (such as the 40-60 minute range in this workout) is provided because athletes will be starting this plan from different levels of fitness. Do not increase your long runs too quickly. If you have a good base you can do runs in excess of the hour that is prescribed. The longest prescribed run in this plan is 70-90 minutes. Athletes training for shorter duathlons who are have a primary goal of finishing the race will achieve the necessary fitness with a maximum long run of 70 minutes. 40 minute heart rate zone 1-2/easy to moderate effort run. Include 6-8 strides. After a warmup and strides, do 20 minutes at 20 beats below your zone 5am. This should be in zone 2. It's a moderate effort just above your easy pace. 60-90 minutes. Warmup then one leg and spinup drills (see http://goo.gl/VjKNv for drills description). Then on flat road or on a trainer use the big chain ring and a gear that allows only about 50-60 rpm. While in the saddle drive the pedals down as hard as possible for 10-12 revolutions of the cranks. Do 6-10 of these starting a new one every 3-5 minutes after warming up. Heart rate is not observed. If these bother your knees then discontinue immediately. 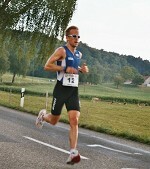 Specific areas of exerptiese inlclude: triathlon, duathlon, running, cycling, mental preparation and nutritional guidance.